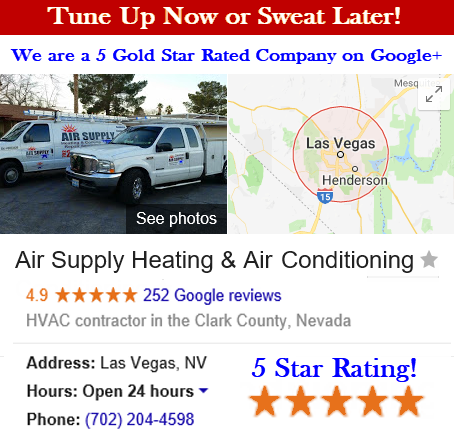 Las Vegas, Nevada and surrounding areas residential homeowners and commercial business owners have come to know the reliability of Air Supply Heating and Air Conditioning. Our high moral standards, friendly customer services, and superior quality performance on all of the full HVAC services we provide has contributed to our goal of 100% customer satisfaction. 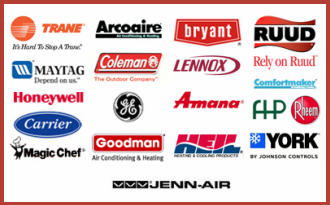 Air Supply Heating and Air Conditioning and our technicians are all fully licensed, certified, and insured. With the use of exclusive professional grade equipment and products, our skillful technicians give you premium results consistently. To better aid Air Supply Heating and Air Conditioning Greater Las Vegas, NV commercial and residential customers, we have provided a frequently ask questions list regarding air conditioning. If you do not see your question posted, please feel free and contact our office, and our friendly staff will answer your questions. Answer: HVAC is Heating Ventilation Air Conditioning. Question: What size HVAC system is needed for my home? Answer: There is not a one size fits all for a commercial business or residential home. A formula needs to be incorporated to determine the calculation needed to figure out the most optimal size. Question: Are there cues to look for to determine the full functionality of my HVAC system? Answer: If you observe abnormal sounds, suspicious smells, excessive dust emitting from your air conditioning unit, or disruptive temperatures, unusually high utility bills there could be a problem with your HVAC system and Air Supply Heating and Air Conditioning should be summoned as soon as possible for issues worsen. Question: How often should I change or clean my filter? Answer: Every three months is a good guide to follow. However if multiple pets and people live in the home, along with smokers, folks who’s allergies seem to trigger often, or those that have frequent asthma attacks, the filter should be at least inspected once a month and if needed, cleaned or replaced. Question: How frequently should I get a maintenance service my air conditioning unit? Answer: It is recommended that your air conditioner gets serviced a minimum of once a year, but twice for good measure. Getting your air conditioning unit serviced at the start of the season and at the end (early spring and late fall) by Air Supply Heating and Air Conditioning can extend the longevity and greatly reduce the need for having major problems. Question: How long does an air conditioning unit usually last? Answer: Depending on the model, air conditioning units can last anywhere between 10-20 years. With regular professional maintenance from Air Supply Heating and Air Conditioning and the diligence of the homeowners doing their regular maintenance, air conditioning units can have their manufactured life span extended. Question: Should I invest in expensive repairs or get a replacement for air conditioning unit? Answer: Air Supply Heating and Air Conditioning can make recommendations concerning the case by case facts. But generally, if an air conditioning unit has needed repairs consistently in the last two years, with repairs getting steadily worse, and your unit is over 10 years of age, it might be more prudent to invest in a new replacement unit. You can get an upgrade with an improved SEER rating that is more energy efficient and runs your HVAC system more smoothly. Question: What is a SEER rating on a air conditioning unit? Answer: The SEER rating or the Seasonal Energy Efficiency Ratio rating indicates how efficient an air conditioning unit is. The higher the SEER number on an air conditioner, the more energy efficient the unit. This will also give you an idea of the operating cost, as a higher rated unit will be more economical to run. For example; a new central air system to be considered high efficient needs to have a SEER rating of 12 or higher. Older air conditioning units have ratings as low as 6, any units manufactured for the U.S. after January 2006 were required to have a minimum SEER rating of 13. 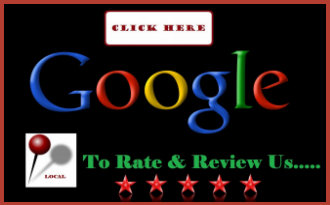 Depending on the brand, there are units available with ratings of 20 or higher. This energy requirement doesn’t apply to window units even so some of those systems still have SEER ratings of 10. We hope this answered your questions. 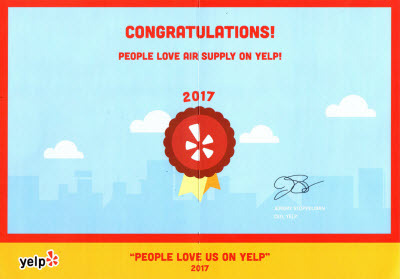 If you have any HVAC system needs for your business or home throughout the Las Vegas Valley, trust in the experts at Air Supply Heating and Air Conditioning! Contact us today!